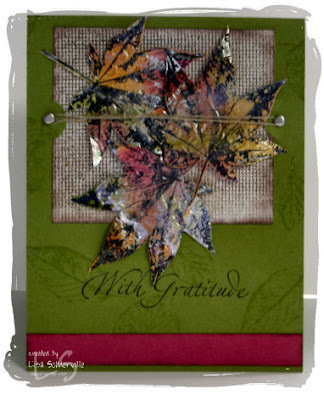 I just love the leaves in the With Gratitude set. A great way to add color to the leaves is by using the Alcohol Splash Technique. (This technique is in the October 2005 TJNL). I decided to morph the technique by adding some Metallic Mixatives and Extender on top of my alcohol splash. Using a tip from Turbo Team Member - Gerrie Johnnic - I ran my finished stamped piece through my Cuttlebug embossing folder to give it texture, then cut out my leaves, curled them a bit, and placed them on dimensionals. Those leaves are gorgeous! I really like the texture and shiny appearance. Will have to look up that technique. bsolutely beautiful! This must be even more gorgeous IRL.